Each of our Childcare Centre’s programming is unique. 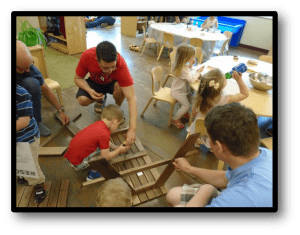 The educators plan activities and projects based on the specific group of children they work with, taking into account their skills, needs, and interests. The educators use their knowledge of child development, How Does Learning Happen?, and Early Learning for Every Child Today, in order to develop their programming to optimize child-directed and play-based learning opportunities. Click below for more information on Emergent Curriculum, How Does Learning Happen?, and Early Learning for Every Child Today. Click here to check out an amazing video submitted by our Klondike location showing an example of emergent, play-based learning at it’s best!! Emergent curriculum is a way of planning a curriculum, based on the children’s interests. Children thrive and learn best when their interests are captured. Learning occurs naturally. Planning an emergent curriculum requires observations, documentation, creative brainstorming and flexibility. Additionally, content is influenced by values held for the children’s learning by the school, community, family and culture. 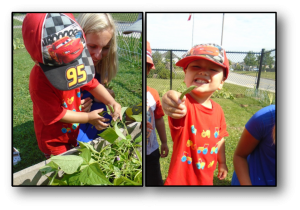 The environment typically consists of learning centres that expand and facilitate children’s learning and encourage independent learning skills. Our Educators understand that the trajectory of learning happens as a consequence of the children’s genuine interest, response, and connection to the subject. 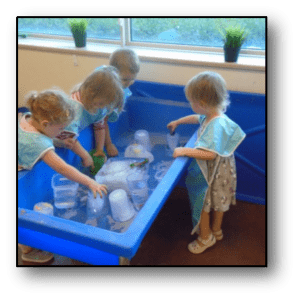 The educators role involves careful observations of the children and their play as well as flexibility and creativity in order to develop learning opportunities that align with their interests. Emergent curriculum allows children to develop long-term projects, deep concentration and the ability to redirect themselves if they are bored or otherwise not engage in an activity. This is fundamental to the development of the positive associations that will support learning throughout their lifespan. How Does Learning Happen? Ontario’s Pedagogy for the Early Years is intended to support curriculum/program development in Early Years programs. Pedagogy is “the understanding of how learning takes place and the philosophy and practice that support that understanding of learning”. Curriculum (the content of learning) and pedagogy (how learning happens) in early years settings are shaped by views about children, educators and families, and the formation of caring and responsive relationships with each other. How Does Learning Happen? focuses on the view of the child, family and educator. It encourages the educator to view the child, family and self as competent, capable and rich in potential. “Children are competent, capable of complex thinking, curious, and rich in potential. They grow up in families with diverse social, cultural, and linguistic perspectives. Every child should feel that he or she belongs, is a valuable contributor to his or her surroundings, and deserves the opportunity to succeed. When we recognize children as capable and curious, we are more likely to deliver programs and services that value and build on their strengths and abilities”. “Families are composed of individuals who are competent and capable, curious, and rich in experience. Families love their children and want the best for them. Families are experts on their children. They are the first and most powerful influence on children’s learning, development, health, and well-being. Families bring diverse social, cultural, and linguistic perspectives. Families should feel that they belong, are valuable contributors to their children’s learning, and deserve to be engaged in a meaningful way”. “Educators are competent and capable, curious, and rich in experience. They are knowledgeable, caring, reflective, and resourceful professionals. They bring diverse social, cultural, and linguistic perspectives. They collaborate with others to create engaging environments and experiences to foster children’s learning and development. Educators are lifelong learners. They take responsibility for their own learning and make decisions about ways to integrate knowledge from theory, research, their own experience, and their understanding of the individual children and families they work with. Every educator should feel he or she belongs, is a valuable contributor, and deserves the opportunity to engage in meaningful work”. How Does Learning Happen? insists that every child should experience the four foundations on a daily basis because they are conditions which a child will naturally seek out for themselves. The four foundations include, Belonging, Well-Being, Engagement, and Expression. Belonging refers to the child’s connection to others. If a child feels a sense of being valued they will succeed at forming relationships with others and feel comfortable to make contributions as part of a group, a community, the natural world. Well-being refers to the physical and mental health and wellness. It includes developmental capabilities, such as self-care, sense of self, and self-regulation skills. Engagement is when a child is able to be involved and focused on what they are learning. Children learn best when they are able to explore the world around them with their natural curiosity. Play-based learning will support them in developing skills such as problem solving, creative thinking, and innovating. Expression and communication occur through their bodies, words, and use of materials. Creating opportunities to explore materials support creativity, problem solving, and mathematical behaviours in a language-rich environment will support growing communication skills. Focusing on these foundations throughout all aspects of curriculum planning ensures optimal learning and healthy development. Ontario Ministry of Education. (2014). How Does Learning Happen? Ontario’s Pedagogy for the Early Years. Toronto. Early Learning for Every Child Today, commonly known as ELECT, provides the groundwork for How Does Learning Happen? Ontario’s Pedagogy for the Early Years. ELECT provides a continuum of development. It is important for educators to understand child development. Knowledge in child development, assist the educators in knowing what to typically expect in developing children which helps them to recognize signs of when a child is experiencing challenges or when his/her needs are not being met. Principle 1: Positive experiences in early childhood set the foundation for lifelong learning, behaviour, health, and well-being. Principle 2: Partnerships with families and communities are essential. Principle 3: Respect for diversity, equity, and inclusion is vital. Principle 4: An intentional, planned program supports learning. Principle 5: Play and inquiry are learning approaches that capitalize on children’s natural curiosity and exuberance. Principle 6: Knowledgeable, responsive, and reflective educators are essential. The Continuum of Development describes a what a child would typically be capable of within broad domains of development. It describes the predictable progression of social, emotional, language, cognitive and physical skills in young children. The continuum is made up of developmental domains (link), that are broken down by root skills (link) and their indicators. A domain is a broad area of development. ELECT focuses on the social, emotional, language, cognitive and physical domains. Root skills are specific capacities, processes, abilities and competencies that exist within a domain. Not only are they important to learn in their own right but they are considered foundations for future learning and development. Indicators are examples of what a child knows or does to prove that the root skill is being learned or practised. Ontario Ministry of Education. (2007). Early Learning for Every Child Today: A framework for Ontario early childhood settings (ELECT). Best Start Panel on Early Learning. Toronto.